Maria & Pablo are professional tango dancers: performers, teachers and directors of "La Academia del Tango" in Vienna. They have been dancing together since 2010. They perform in Buenos Aires (Salón Canning, La Baldosa, Club Gricel, Sin Rumbo, La Maldita Milonga, Portenio y Bailarín) and Europe (Munich, Athens, Vienna, Linz, Salzburgo), have been invited to dance for several embassies in Vienna and at the "Wiener Konzerthaus" in front of 1500 people. 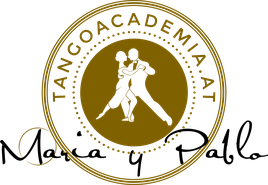 In August 2014 they founded "La Academia del Tango Argentino" and opened their own tango studio - the "Tangoloft" in Vienna/Austria. For performances and workshops they also go abroad. If you would like to invite Maria & Pablo to your city please contact them. Quality is very important to them, which is why they go annually for several months to Buenos Aires to train with some of the most renowned Tango couples in the world. Since 2015 they work intensively with Sebastian Arce, one of the most renowned tango dancers of our times. Since 2017 Sebastian Arce is a regular guest teacher at Maria & Pablo's tango academy at Tangoloft Vienna.